Grilled Salmon Burgers & More for Father’s Day! Father’s Day is Sunday and many of you will have family over to BBQ for the occasion. However, it’s also bathing suit season and even though you might like to indulge in the burgers and ribs, you’re really trying your best to watch the fat intake. So what can you do when the menu is burgers and chicken, or ribs and chicken and you want fish? 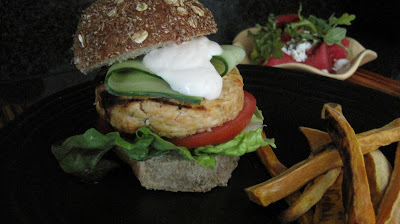 Salmon Burgers to the rescue! In addition to the other fare you’re serving why not add something healthy like Salmon Burgers along with Sweet Potato Fries, chilled Watermelon, Goat Cheese and Arugula Salad and of course dessert – Chocolate Cups filled with Ice Cream Sundae? OK so the dessert has a few more calories but YOU could use fat free yogurt in them. I love these burgers and if you’re a fan of salmon you will as well. They’re moist, delicious and so simple to prepare. A one pound skinless fillet of salmon will make 4 nice size patties to pop on the grill or if preferred on the stove top or oven. 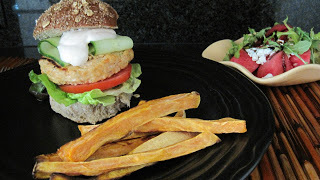 Check out this recipe and I think you’ll agree these Salmon Burgers need to find a place on your Father’s Day menu. Blend ingredients together. Place in refrigerator until ready to use. If prefer a milder sauce blend the Greek yogurt with 1/4 of the cucumber and a sprig of fresh dill. Blend in processor or blender, chill until ready to serve. 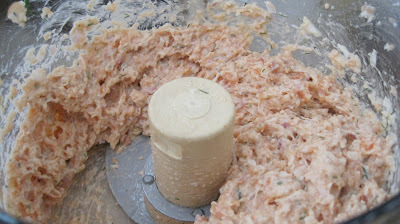 In a food processor, combine all ingredients and pulse until well combined, leave slightly chunky like hamburger meat. Preheat the barbecue for medium-high heat grilling. Cook the burgers 3 to 4 minutes on each side or until just cooked through the center and golden brown. Alternately, in a large saute or grill pan add 2 Tbsp. of canola oil and turn to medium heat. Place the burgers in the pan and saute for 3 to 4 minutes per side or until just cooked through the center. Put a lettuce leaf and 2 slices of tomato on the bottom bun, place the burger on top, adding 2 ribboned, sliced cucumbers then top with yogurt sauce. Place bun on top and serve. YUM!!! Peel and slice 3 Sweet Potatoes. Cut into wedges or using a mandoline cut into matchsticks. Line a sheet pan with heavy duty foil and spray with non-stick spray. Lay sweet potato slices on pan and place in oven for approximately 20-30 minutes or until cooked how you like. (My husband likes them crispy). Here’s another healthy burger you might like to try. Happy Father’s Day! Have a great weekend! These sound delicious! And they look so easy to make! Hi Vicki! Everything looks delicious and the watermelon salad with it sounds perfect! BTW – the chocolate balloon? Brilliant! The burger looks so man and loaded with flavours. Those wholewheat buns are great too. I’ll take this salmon burger over meat burger anytime ! It looks utterly delicious ! Thank you for your comments. I first made this burger about 5 years ago and fell in love with it but have hardly made it since. Suddenly with the weather heating up along with the grill I decided I needed to find my notes on it again. It’s so tasty. If you’re a fan of salmon I know you will love these. Please let me know what you think if you try them. Yum these look really tasty, I would have not thought to process the salmon but I bet it’s just wonderful. They look delicious! Salmon is a favorite but I’ve never tried them as burgers. A very delicious sounding dinner, for sure! Have any room at your table? Those salmon burgers sound terrific! Hope you have a great weekend too. 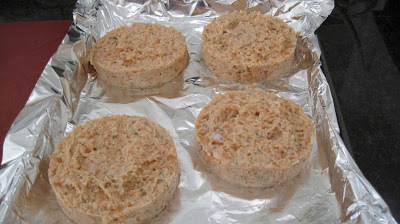 These salmon burgers look delicious. I’d imagine they would have a similar texture to crabcakes or crabmeat burgers. I just cooked some salmon belly today and being sold as offcuts in the fish markets here, it was truly a deliciously cheap meal, not to mention incredibly healthy too. Lovely and neat burgers! I hand-shape mine and they look like big lumps instead of burgers! Vicky, this sounds SO great – I’ve bookmarked this – salmon burger are SO the way to go – goodbye hamburger!!! Salmon is my favorite but never tried burger patty with it. Actually I did make patties but never had them in burgers.Sweet potato fries, I know they taste awesome. Your patties look perfect Vicki.! Salmon burgers really make a great treat….I am sure every dad would be happy when their daughters make such a healthy spread especially for them. Your instructions are clearcut and very easy to follow. Great post! I know perfectly well how to make salmon burgers, but I always end up buying them at Whole Foods. Silly – although theirs are quite good, making my own is so much less expensive. Plus there’s nothing like a freshly made burger! Love your spicy yogurt sauce – I’ll have at least 1 teaspoon of Sriracha in mine! Thanks for a super post. I’m glad you all enjoyed my Salmon Burger recipe and hopefully the others as well. Sorry it’s taken a bit to reply back to all of these. They’re so easy to make, literally tossing everything into the food processor and giving it a whiz. I did use my old Tupperware hamburger mold to shape each one. DO NOT forget to spray the burgers with non-stick spray prior to placing them on the grill otherwise they WILL stick. You can also make these ahead and place in the refrigerator, spraying just before adding to the grill. This will firm them up a bit as well making them easier to transport from platter to grill. I hope everyone enjoyed celebrating Father’s Day and if you tried my salmon burgers I hope you enjoyed them. My gosh your salmon burgers look amazing! I especially love the spicy yogurt sauce on this though. I’ve never made fish burgers before, and definitely would love to try this out! these look incredible, i love that spicy yogurt sauce! The salmon burgers look incredible!